The phone is ringing and a friend is excited to tell me there’s a discussion about frogs right now on WNYC radio. Robin Moore, the author and photographer of “In Search of Lost Frogs,” is being interviewed on the Leonard Lopate Show (The Conservation Efforts Trying to Keep Frogs From Going Extinct). At the same moment, a Jersey City colleague is emailing me about the same thing and writes that she’s left a comment about Frogs Are Green and our kids frog art project on WNYC’s website. During the interview they discuss many of the issues that frogs face today, including the deadly Chytrid Fungus and climate change. One caller asks about the drought situation in California and its toll on frogs. They also talk about how many frog species have gone extinct in the wild and at the same time new species are being discovered, as close as New York. 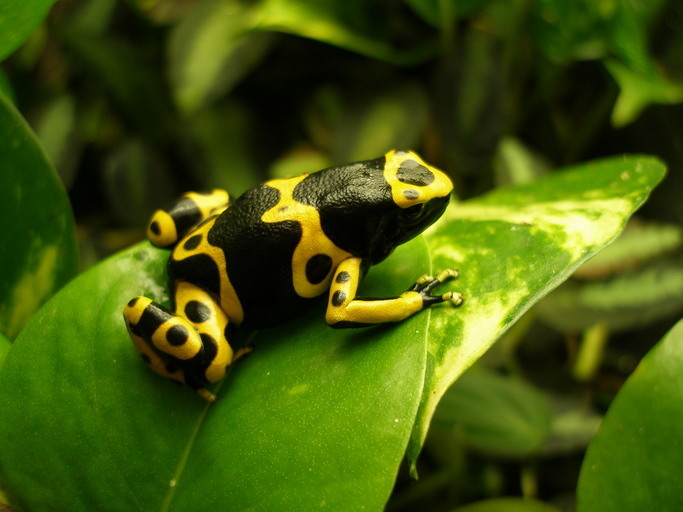 They also talk about how important the medical research is as they test the poisonous skin of dart frogs. Almost every day, Facebook friends post on my timeline or the Frogs Are Green page, or Tweet at us about frogs and/or the environment. I’m happy to tell you that in six years we have reached over a million people. Each month we have 13,000 visitors who look at more than 32,000 pages, which gives us an amazing bounce rate of 1.8 %. Yes, that is not a misprint, we have a 1.8% bounce rate. These stats have been holding steady for years and are again on the rise. We didn’t used to post on Facebook, Google+, LinkedIn (groups) and Twitter every day, but in 2014 we made a commitment to do so and reach more people than ever. As the above story shows, our mission is working. Awareness really begins to catch fire when others know you so well that they support and advance your campaign goals without hesitation. It all comes from zeroing in on a niche and being consistent by sharing every day. By being “top of mind” on a particular thing that’s so different, so unique, they just see frogs and think of Frogs Are Green. Make sure that your website (the nucleus of your online presence) is 100% on target in expressing your mission and goals. On your homepage be brief and entice, don’t overwhelm with too many calls to action. Make sure your brand and mission are crystal clear. Be sure you are blogging and/or adding new, valuable content consistently. Be sure when you blog, post, or tweet, you are adding an appropriate and eye-catching photo that will prompt others to share it, not just “like” it. Don’t try to sell all the time with posts/tweets about buying products, classes or donating to your cause. Once in a while is all right, but you will really build your audience by sharing significant information. As they move around your website reading articles they will come to respect your efforts and just may click that donate button on their own. Your “competition” organization is your friend. Remember, you are both trying to help others, save wildlife and the environment, and so those that follow those other organizations may follow you too! Be kind and retweet. If you are planning to boost or advertise, make sure you are being selective about the information and target audience. Do your homework and know where your target is, both online or offline. Remember that your target audience can be in many different places. Be sure to review your Google Analytics each week and identify if what you are doing is working. For example, if you are spending most of your social media time on Facebook but when you look at your stats you have more people visiting your site from Twitter, you should tweet more often than you are! People consume content in many different ways, so be sure you are creating video for YouTube, audio for Podcasting, Powerpoint (for Slideshare or LinkedIn), photo galleries on Flickr, Pinterest and Facebook, blog posts that can embed these other media files, graphic images, and more… (and then share across social sites). When you have new media to share, don’t post on every social site at the same time and then not post for a week until the next post. Schedule different places each day so your content is circulating all the time. Be sure to alert the local media about events and other important news so that they can write about you. If you don’t tell them yourself, how do you expect them to know? Publicity helps awareness and begets more publicity. Originally published on Frogs Are Green by Susan Newman. Ask any child whether they like frogs and the answer is always YES! When I walk around my own neighborhood, I see children with frog umbrellas, boots, hats and they can easily imitate the sound of a frog too! Ribbit! This is why Frogs Are Green was founded in 2009. Bringing awareness everyday to what’s happening on our planet and that frogs everywhere are disappearing. We’re giving children the opportunity to learn about the environment, frogs and amphibians and express themselves. 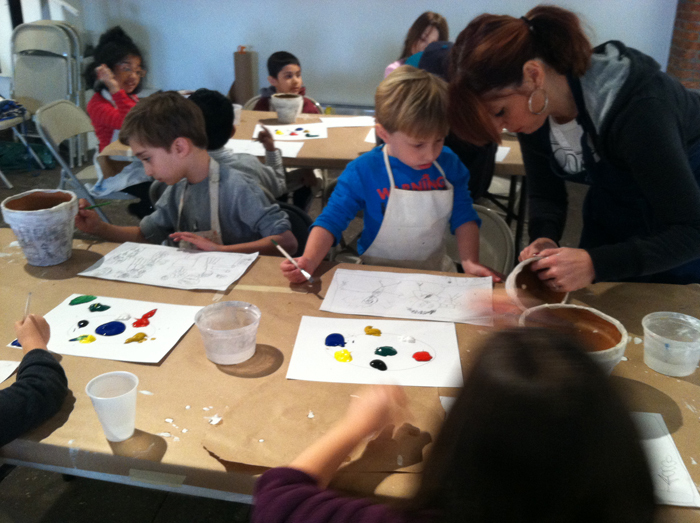 It’s through art that even 3 year old’s can share what they think. 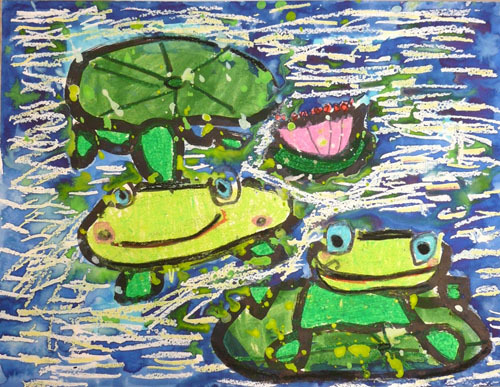 This past April, Frogs Are Green partnered with The Distillery Gallery and Artspace in Jersey City, to exhibit 100s of artworks received from children around the world. 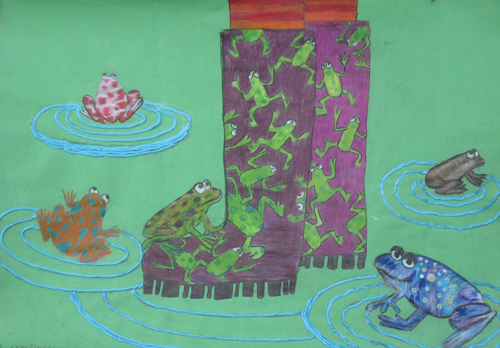 This was the 1st exhibition of artwork received from international children for the annual Frogs Are Green art contest, 2009 through 2013. Some artwork was hung on the walls of the gallery space and 162 were shown via digital projection. The Distillery Gallery and Artspace was chosen for this exhibition because they have children’s art classes on Saturday mornings and those young artists participated in the show as well, by displaying their frog pictures and beautifully painted flowerpots created for the Earth Day / Save The Frogs Day events. Won’t you please share our efforts, so we’re building awareness in children, who are the future stewards of our planet. It’s our Green Dream that this exhibition will travel to a city near you now! Susan Newman, founder of Frogs Are Green is now taking this international frog art education exhibition on the road. To learn more about this presentation for your school, library or exhibition space, contact Susan today!